V. What Do the BSRI and PAQ Measure? 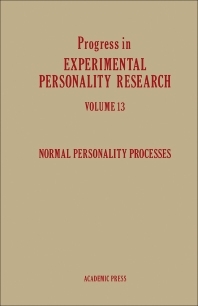 Progress in Experimental Personality Research, Volume 13: Normal Personality Processes focuses on the theory and measurement of personality research. This book begins with a detailed analysis of theoretical and conceptual aspects of gender research, followed by a discussion of the theoretical framework for the study of action control or choice behavior that encompasses a wide range of normal human action in addition to providing a schema in which the concept of “learned helplessness” might be handled. This publication concludes with a review and synthesis of data treating juvenile delinquency as a phenomenon of impression management and report on the personality correlates of chronic headache. This volume is recommended for psychologists and specialists researching on normal personality processes.